Ant Muzak has been released on DVD. The dvd contains ‘Ant Muzak’, together with it’s 2 companion pieces BLAKE’S JUNCTION 7 and WORLD OF WRESTLING; all written by Tim Plester and directed by Ben Gregor. 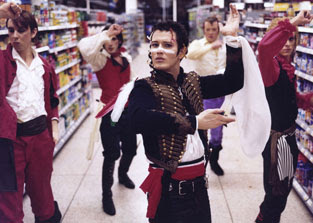 The dvd also contains some 55 minutes of “bonus material”, which includes a never before seen ‘Ant Muzak’ trailer and an exclusive 8-minute “behind-the-scenes” ‘Ant Muzak’ featurette, which contains footage of Gary Tibbs dancing the Prince Charming down a supermarket aisle.